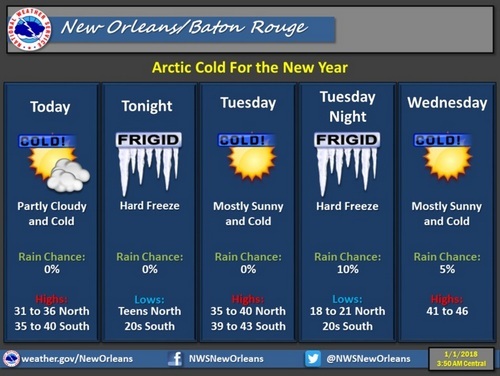 The freezing temperatures that opened the New Year in New Orleans will continue for much of the week, staying in the 30s during the day and dipping back into the 20s overnight through Thursday, according to the National Weather Service. Monday’s temperature was hovering below freezing in the morning but expected to rise to a high of around 35 degrees by afternoon, according to the National Weather Service’s New Orleans/Baton Rouge office. Temperatures will start to fall again around dusk, plunging to a low of 22 degrees overnight. Tuesday’s high may reach 39 degrees, but wind chill could make it feel as cold as 9 degrees, the National Weather Service predicts. Overnight, the temperature will fall again into the 20s, with “a 20 percent chance of light snow after midnight,” forecasters say. Wednesday and Thursday are both expected to have daytime temperatures in the low 40s, with nighttime temperatures falling just below freezing again. By the weekend, daytime temperatures will gradually rise into the upper 40s, 50s and perhaps even the 60s, bringing an end to the overnight freezes as well, the forecasters say.